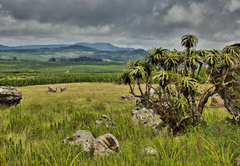 One of the country's most scenic self-drives, the Panorama Route, explores the Mpumalanga highlands, or the north-eastern section of the Great Escarpment of the Drakensberg. In these rugged mountains the plateau comes to an abrupt and dramatic halt, falling steeply away into the Lowveld accompanied by incredible views out over the grasslands of Africa. Did you know? Once you've booked your hotels or Panorama Route accommodation, explore the destination pages below for info on attractions, activities and things to do when you visit the Panorama Route. To describe the natural attractions with the written word is difficult, but people recount being able to 'touch the clouds' whilst others have called the route the 'most beautiful place in the world'. 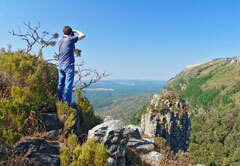 The Panorama Route's popularity has much to do with its proximity to the Kruger National Park. 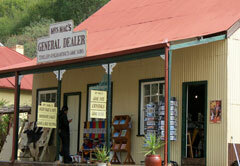 It is often part and parcel of any organised trip to the game reserve. But it is also favoured for the access it provides to one of the province's major scenic draw cards, the Blyde River Canyon. 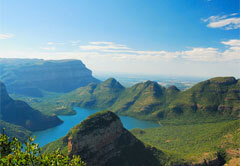 The Blyde River Canyon is one of the largest canyons on earth, and increasingly popular with overseas visitors. Did you know? 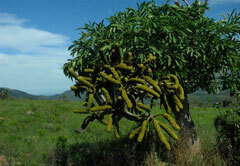 There are a number of nature reserves and game parks along and near to the Panorama Route. These include the world-famous Kruger Park as well as the Ohrigstad Dam Nature Reserve, Sabi Sands Game Reserve, Mount Sheba Nature Reserve and Gustav Klingbiel Nature Reserve. The most popular stretch of the route is the R532 that winds its way from the town of Sabie via a selection of graceful waterfalls - the Sabie Falls, Bridal Veil Falls, Mac Mac Falls - to God's Window, the Blyde River Canyon, Bourke's Luck Potholes and the three Rondawels. 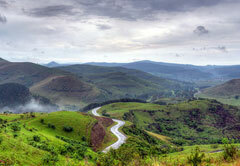 The famous Lowveld View is not even 5 km north of Bourke's Luck Potholes. This view out over the canyon from a height of 1 219 metres above sea level, the Blyde River cutting its way through the valleys below and the Blydepoort Dam in the distance, is unspeakably beautiful. To rush the drive would be to miss the enchantment. Hazyview makes a good stop for lunch, or as a launch pad into the Kruger National Park, and Graskop makes a good base if you plan to drive the Panorama Route over a couple of days. 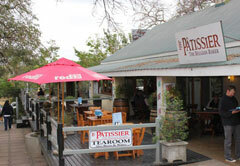 There is also a long list of attractions in amongst the natural highlights – like the Hoedspruit Endangered Species Centre, Tsakani Silk Farm, interaction with elephants, farmstalls, eateries, hiking and MTB trails, a coffee farm and roastery, art galleries and cultural village experiences. There is far too much to do the route in one day. Best driven: during winter when it is dry, for the wet season brings with it mists and rain that, whilst beautiful, hinder the views. 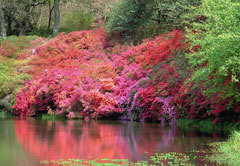 In summer the road sides are awash with wild white and pink lilies.